Make the painting event with friends, be it birthday, anniversary, bachelorette party or women's party a creative event. We have coffee, tea and non-alcoholic drinks ready for you. Your own Prosecco to toast, we are of course happy to cold. 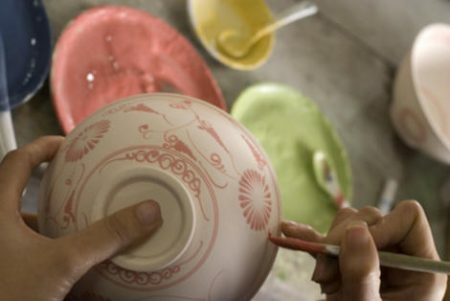 The minimum sales of ceramics is 20, - € per person. Cakes or snacks to eat, which need no extra table, you are welcome to bring along, as well as the droplets for toasting. For this we charge a picnic fee of 3 € per person (Friday, Saturday and Sunday 7 €), regardless of how many people actually consume something. The picnic fee includes hot drinks as well as non-alcoholic drinks from our side. We will gladly provide you with a side table for a fee of 20,00 €. For every ½ hour started outside the regular opening hours we charge 17,50 € flat rate. You as a closed society also like to stay with you. For this we charge for the whole store: 350, - per hour, the half shop: 175 € per hour. The minimum turnover is to be paid in advance as a reservation deposit. The booking is only binding when the form and the deposit have been received. You can cancel your event until 1 week before in writing or by mail and receive the deposit in full. After that a cancellation fee of 120 € will be charged. For an unused minimum turnover, you will receive an always redeemable and unlimited, transferable voucher.